London’s Comedy Cafe Theatre has found a new home – almost nine months after being forced out of its former site by rising rents. The venue shut its doors on New Year’s Eve, after 26 years, with owner Noel Faulkner, pictured, blaming the gentrification of the area for spiralling costs. ‘Now it’ll become just another overpriced bar for Shoreditch twats with their big beards and skinny jeans who think they’re too cool for comedy,’ he said at the time. 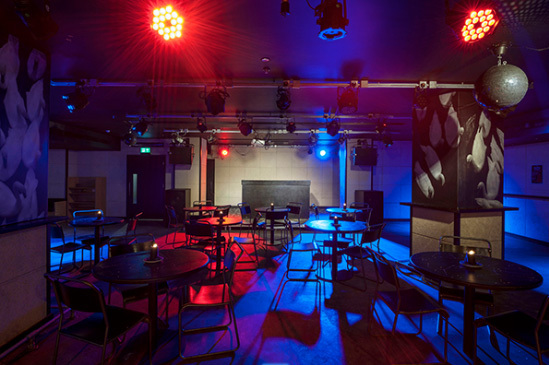 Now, however, he has found a new room less than 200 yards away – the Miranda basement bar at Ace Hotel London Shoreditch. Faulkner says he has kept the venue in the neighbourhood to help keep ‘some of the grit that originally made the area an artistic, creative place’. However, he has recruited a TV name to kick off the new venue, with Alan Davies playing on opening night, Saturday September 16. Faulkner will run a pro night on Saturdays, while the Comedy Cafe’s new act night – which helped give an early platform to future stars including Jimmy Carr and Simon Amstell – on Tuesdays. ‘Without comedy clubs, the next generation of big comedy names have nowhere to learn their craft - that's why the new act night is so important to us,’ he said .’I can see if somebody has it in two minutes, and I only book line-ups with people I know will deliver the goods.